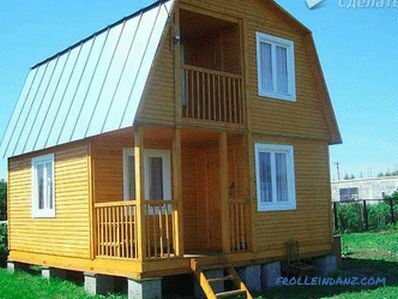 Among the variety of roof structures, a sloping gable roof occupies a special place. Its feature is in dividing the slope into several planes, making it possible to use the space under the roof for the attic device. 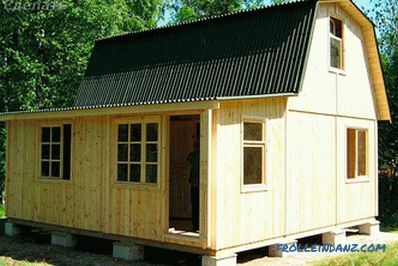 Having a room under the roof will reduce the overall heat loss of the house. A broken roof with its own hands can be properly built only if you have competent calculations and follow all the standards for construction. 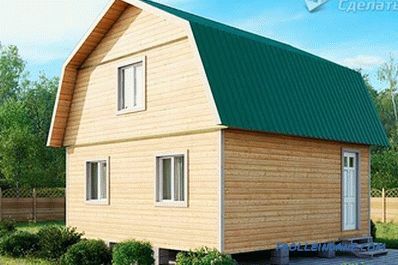 purpose of the room — for a dwelling, the height of the ridge is not should be placed below 2.5 meters. The optimal value for the upper slopes is 30-45 degrees, for the lower ones - 60 degrees. Any construction begins with a drawing , and such a complex structure as a broken roof, will require the preparation of a detailed scheme with all sizes and calculations. 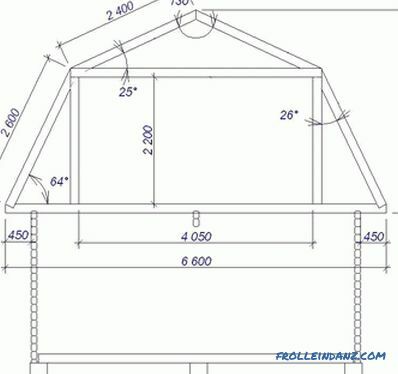 You can get started with viewing photos and diagrams that will help you understand how to build a broken roof structure. 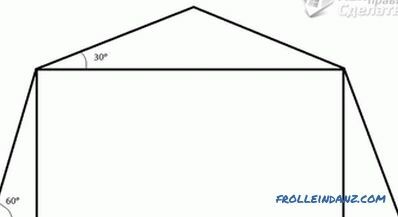 Knowing the size of the building, the type of roofing and insulation material, it is possible to calculate the dimensions of the components for the truss system using special calculators. The consumption of material for roofing, as well as waterproofing, is calculated from the value of the roof area, which is calculated by adding the value of all ramps. 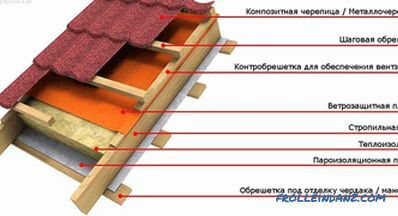 Insulation layer for mansard roof must be at least 20 cm. 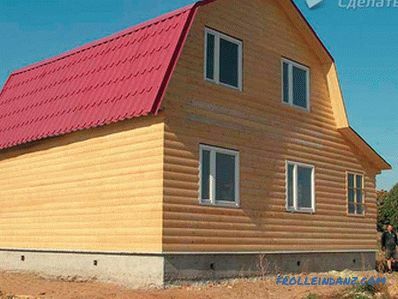 Before you make a sloping roof, pick up quality material for its construction. 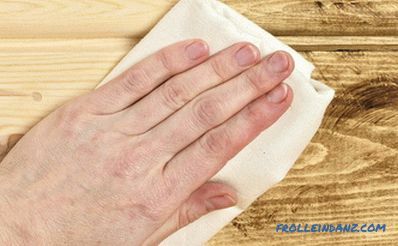 To do this, acquire dry glued timber, the humidity of which is 18-22%. Before installation, it undergoes obligatory treatment with antiseptic and anti-burning agent. Processing compositions carried out in open space, the funds are applied in two layers. Mauerlat . Installation of truss construction is expected during the wall construction phase. In the top row, special pins are laid for subsequent mounting of the mauerlat, which is the basis of the roof. This timber is laid along the entire perimeter of the walls, prepared studs are inserted into the drilled holes and twisted with nuts. 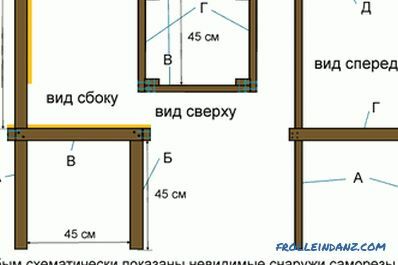 The stud spacing is two meters, the best option if they are located between the rafters. Under the mauerlat the roofing felt keeps within, providing protection against moisture. 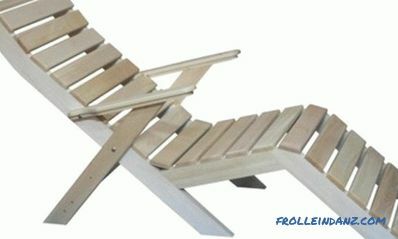 For reliable retention of the structure using wire strapping. Beams. A thick timber with a section of 200 * 200 mm is placed directly on the mauerlat or in special pockets left in the wall masonry. The edges of the beams located on the masonry are coated with mastic. The beam will serve as a support for vertical posts. To the mauerlat they are attached with metal corners. 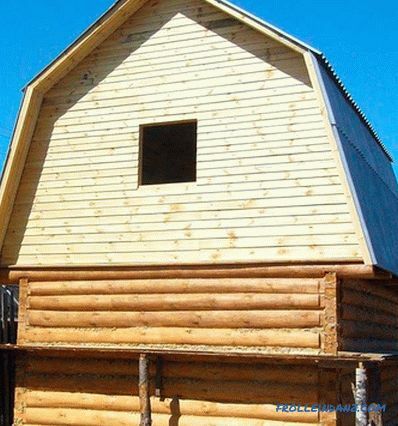 Requires strict adherence to the horizontal level to get a quality basis for the roof. You can change the position of the beam by placing boards. Installation of rafters. The first vertical exhibited on the gables. Their level is controlled by a plumb line. Racks are temporarily fixed with struts. Between the exposed rafters, they tighten the cord and install all the remaining supports in increments equal to the location of the beams. Girders from the board are stacked on the racks; they are fastened with angles and screws. On top of the girders, longitudinal fasteners are fastened connecting the racks and completing the upper trim. Before the final installation of the remaining rafters, the inlays are supported by struts. Lower rafters are installed with support on the girder and power plate. 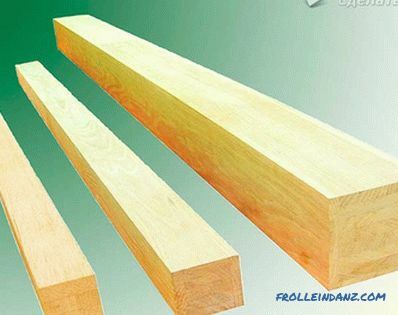 To facilitate the work on the preparation of bars, pre-running template. A thin board is applied to the girder and sawing is performed at the desired angle. All lower rafters are trimmed on the model and installed. The lower part, lying on the Mauerlate, is cut out on the spot. 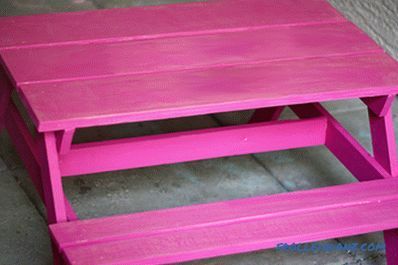 For fastening use plates or corners, twisting them with screws or hammering with nails. 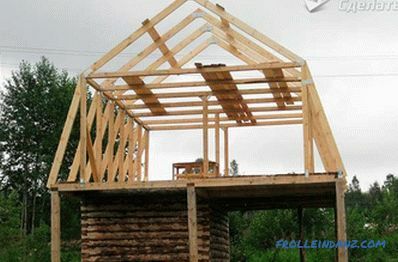 Before installing the upper hanging rafter, it is necessary to outline the center of the roof. To do this, use a temporary rack, fixed at the center of the power plate and gable end. The top edge of the board will mark the center of the roof.The basis for the template is applied to this board, on which the sawnings of the upper rafters will be carried out, the second edge of the workpiece rests on the girder. All upper rafters are the same size, so they are filed on the same pattern. The upper ends of the rafters are connected by scraps of boards, plates or bots. The lower part is inserted with gash in the girder and fastened with corners. Each rafter leg is supported by a suspension rack of 25 * 150 mm in size, which is attached to the junction of rafters and to an inhaling. Lower rafters are reinforced with permanent braces. 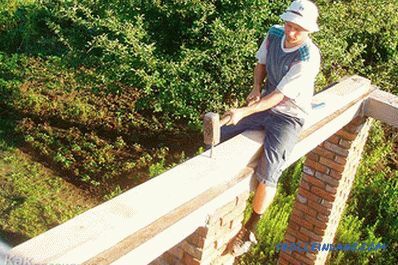 To do this, use the board 50 * 150 mm, the lower end is cut at an angle and mounted on the beam, the top is attached to the rafter with a bolt or stud. Installing all the struts, remove temporary props. After the installation of the truss, it is necessary to correctly lay all layers of the roofing pie. Initially, the rafters sheathe vapor barrier membrane, starting from the bottom of the roof. The joints of the material are taped. Then stack insulation. Between the layer of insulation roofing it is necessary to install air ducts for ventilation of the space. Poor quality ventilation will cause condensation and moisture. The roof covering should be selected taking into account its heat-insulating qualities, therefore the use of metal is not desirable. As a heater, choose non-flammable safe materials that are not exposed to moisture. These materials include polystyrene foam and foamed glass. After insulation, waterproofing is performed. Lathing is performed directly under the selected type of roofing. The device of a broken roof will not only give a special look to the architecture of the house, but will also provide additional living space. 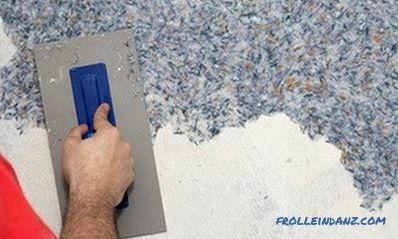 Watching the video with explanations of the construction nuances will help you get the job done right. 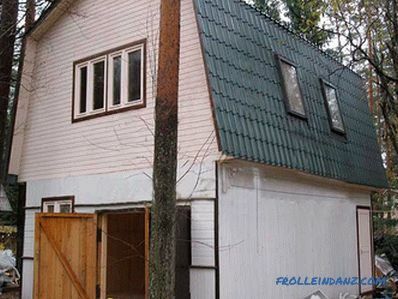 how to sheathe the house with siding.